When it comes to shutters, finding the best quality at a great value is key. While some prefabricated options offer a lower overall cost, it’s never worth it to compromise quality for savings. You’ll want your shutters to be built to last and perform in your home or business for years to come. Because of this, custom shutters are the best option for any buyer. The little bit extra that you pay in advance will be well worth the benefits you receive in the future as they will constantly out perform and outlast prefabricated options. To give you a better idea of how choosing custom over prefabricated shutters can benefit you, we’ve provided the list of benefits below. Fit to your windows and doorways: Because prefabricated shutters aren’t made to fit your unique window structures, the can be a pain to install, and even more difficult to operate. You can estimate sizing and find one that fits best, however, you can’t achieve a true, custom fit with prefabricated. This can result in damage to your windows and doorways from installation attempts and regular usage. Built to last: Custom shutters are more likely to have been built by experienced professionals using quality materials. Prefabricated shutters are built in bulk in larger factories that typically don’t have the time or capabilities to create shutters of exceptional custom quality. Custom design: Finding design elements that complement one another can be extremely difficult. This is why custom shutters are a great option for home and business owners looking to stay within a specific color theme or design. They can be built using materials and designs that complement a variety of goal aesthetics from rustic, to classic and modern. Increased functionality: Whether you’ve chosen a classic French door or modern, space-saving sliding door, having a quality shutter covering it allows for increased privacy and optimal appeal. Prefabricated shutters can make covering unique door and window styles difficult as they are not built to the specifications of the door. Rather than attempt to purchase, size and install a set of shutters that may not work on your unique door or window, opt for a custom option for higher quality and appeal. 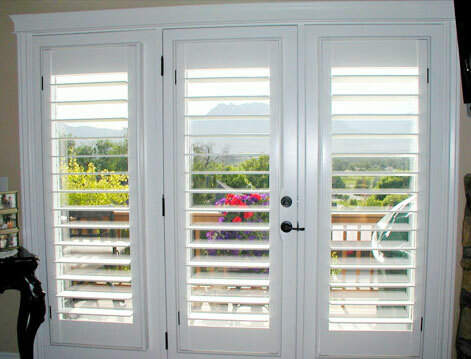 This way you can be sure that your shutters will have full range of movement and fit well after installation. For more information on our custom shutter options, stop by our shutter information page or give us a call at 801-467-8823 to speak with a friendly and knowledgeable Stanfield Shutter representative.